Boophane disticha medium BULB – Fan-leaved Boophane (e), Gifbol (a), leshoma (SS), incumbe (Sw), incotho (z,x). Very, hardy, deciduous plant with a huge bulb. In warm areas the bulb is held above the soil while in colder areas is is below ground level as a protection against frost. The large red flower head appears in early spring before the leaves. 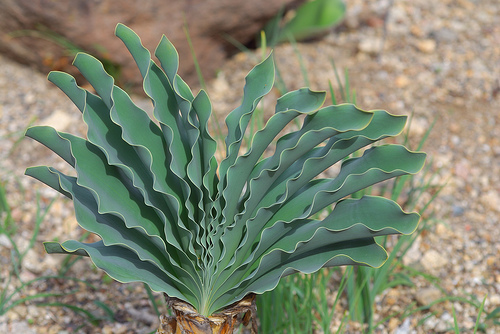 The grey-leaves are held in a twisted fan shape and are most attractive. The leaves of this form have wavy edges. Once the flowers have been pollinated each flower stalk elongates and carries the seed on the end to form a tumbleweed. This is the plants strategy for distributing its seeds. Plant in full sun or semi-shade with an exposed bulb. Extensively used in traditional medicine. The bulbs are 5 years old. The price is for one bulb.